Dune fences are a common and iconic site along the beaches of the New York and the 'Hamptons'. The dunes which line the beaches of Long Island south shore act as a storm break and barrier to the powerful Atlantic Ocean. Over time, storms, winds and surges take their toll on the fences as well as the dunes. This iconic Dune Fence located near Flying Point Beach in Southampton, New York has done it's job well but is in need of some attention. 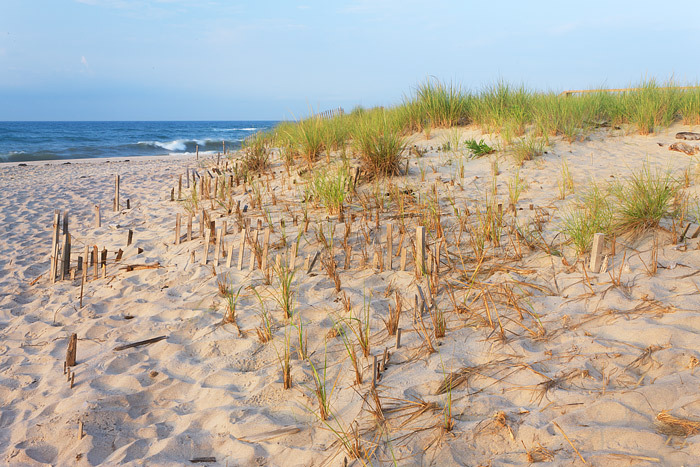 Pieces of the dune fence can be seen scattered throughout grasses and dunes as they lead the beach goer toward Flying Point. Photo © copyright by Thomas Mangan.